People love amplified antennas. While there’s no substitute for a giant antenna on the roof, an amplified antenna can make the most of a small space. A clean, modern amplifier helps weak signals travel over a cable to your television without getting lost. Today’s antennas are designed to last for years. But, let’s be honest. Sometimes things break. Sometimes you step on a cable or pull something out of the wall the wrong way when you vacuum. This can be true of the power supplies that come with antennas too. (We call them “power injectors,” and I’ll explain why below.) Unfortunately these power injectors aren’t usually sold separately. So what can you do? 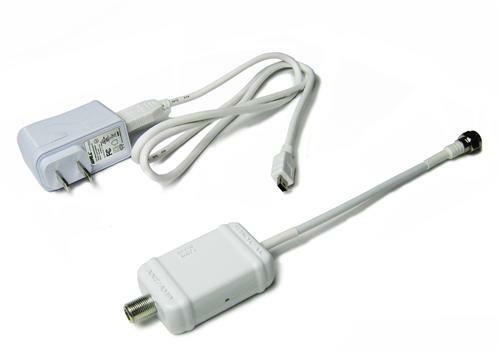 Many antennas and amplifiers, like Winegard’s Elite antenna and LNA100 amplifier use USB cords for power. In this case you’re really in good shape. You can use pretty much any USB charger. Generally even the cheap ones from the drug store will work. As long as the cable is intact, you can plug the cable into any charger cube and it will work. If the cable is the problem, you can replace it with almost any identical one. Just be sure that you’re using the right cable. For some reason a lot of antennas still use the Mini USB standard (at left) while pretty much all phone cables today use either Micro USB (at right) or USB type C. You can still get the older Mini USB cables at Solid Signal or anywhere you buy stuff like that. We call power supplies that use a coaxial connection “power injectors.” A power injector puts power on the same cable as the signal. The two don’t interfere with each other because of some neat accidents of physics. This is an old power supply from a DIRECTV DECA. It might work in a pinch, but it might not. Here’s how to tell. Every power supply will have a rating showing the number of volts and amps it supplies. The volts are most important. You want a power injector that supplies the same number of volts as the one you’re replacing. Too few volts and the amplifier won’t work. Too many and the amplifier will run hot or burn out. You can usually choose a power injector with a volt rating within 2-3 volts of the one you’re replacing. If your old injector uses 12 volts you can usually get away with 10 or 14, but don’t go much further than that. Here you have some flexibility. You can use a power injector with an amp rating that’s higher than your current one, just not lower. Remember it’s metric, so if your current injector is 500mA, that’s also known as .5A. You can use a 1A or 2A injector. The amplifier will pull the amps it needs to pull. If you use an injector without enough amps the injector will burn out quickly. It’s still always best to use the absolute correct power injector but if you can’t, this should help you get by in a pinch. You can use this splitter to put power into the line. Connect the power injector to one of the OUT ports, connect your antenna into the IN port, and connect your TV to the other OUT port. This is the same technology that’s in the passthrough ports on other power injectors.